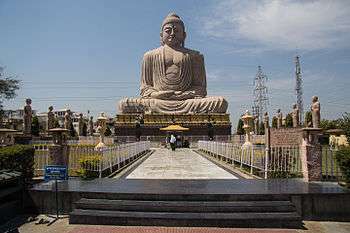 ↑ Constituents of Bodh Gaya Plannina area are Bodh Gaya Nagar Panchayat, 32 villages in Bodh Gaya CD block and 3 villages in Gaya CD block of Gaya district. Bodh Gaya is the most holy place for the followers of the Buddhist faith all over the world. Situated by the bank of river Neranjana the place was then known as Uruwela. King Ashoka was the first to build a temple here. Traditionally, Buddha was born in 563 BC in what is now Nepal  on the following auspicious Baisakhi purnima. As Siddhartha, he renounced his family at the age of 29 in 534 BC  and travelled and meditated in search of truth. After practicing self-mortification for six years at Urubela (Buddhagaya) in Gaya, he gave up that practice because it did not give him Vimukthi. Then he discovered Noble Eight-fold path without help from anyone and practiced it, then he attained Buddhatva or enlightenment. Enlightenment is a state of being completely free from lust (raga), hatred (dosa) and delusion (moha). By gaining enlightenment, you enter Nibbana, in which the final stage is Parinibbana. 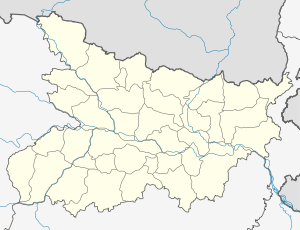 The complex, located about 110 kilometres from Patna, at 24°41′43″N 84°59′38″E﻿ / ﻿24.69528°N 84.99389°E﻿ / 24.69528; 84.99389, contains the Mahabodhi Temple with the diamond throne (called the Vajrasana) and the holy Bodhi tree. This tree was originally a sapling of the Sri Maha Bodhi tree in Sri Lanka, itself grown from a sapling of the original Bodhi tree. It is believed that about 280 years after the Enlightenment of the Buddha, Emperor Ashoka visited Bodh Gaya. He is considered to be the founder of the original Mahabodhi temple. It consisted of an elongated spire crowned by a miniature stupa and a chhatravali on a platform. A double flight of steps led up to the platform and the upper sanctum. The mouldings on the spire contained Buddha images in niches. Some historians believe that the temple was constructed or renovated in the 1st century during the Kushan period. With the decline of Buddhism in India, the temple was abandoned and forgotten, buried under layers of soil and sand. The temple was later restored by Sir Alexander Cunningham in the late 19th century. In 1883, Cunningham along with J. D. Beglar and Dr Rajendralal Miitra painstakingly excavated the site. Extensive renovation work was carried out to restore Bodh Gaya to its former glory. It has a height of 55 metres which can be viewed from a distance of 11 km. Several Buddhist temples and monasteries have been built by the people of Bhutan, China, Japan, Myanmar, Nepal, Sikkim, Sri Lanka, Taiwan, Thailand, Tibet and Vietnam in a wide area around the Mahabodhi Temple. These buildings reflect the architectural style, exterior and interior decoration of their respective countries. The statue of Buddha in the Chinese temple is 200 years old and was brought from China. Japan's Nippon temple is shaped like a pagoda. The Myanmar (Burmese) temple is also pagoda shaped and is reminiscent of Bagan. The Thai temple has a typical sloping, curved roof covered with golden tiles. Inside, the temple holds a massive bronze statue of Buddha. Next to the Thai temple is 25-metre statue of Buddha  located within a garden which has existed there for over 100 years. On 7 July 2013, at around 5:15 A.M., a low intensity bomb blast took place in the 1500-year-old Mahabodhi Temple complex. This was followed by a series of nine low intensity blasts and two monks were injured, one Tibetan and the other a Burmese. These blasts were carried out by an Islamic terrorist organisation, to seek revenge for the killings of Muslims in Burma. The serial blasts did not cause any damage to the temple or the tree under which Buddha attained enlightenment. Two other bombs, one under the 80-foot statue of the Buddha and the other near Karmapa Temple were defused by the police. Investigation of the blast was given to NIA (National Investigating Agency). Three unexploded bombs were also found in the Temple complex. 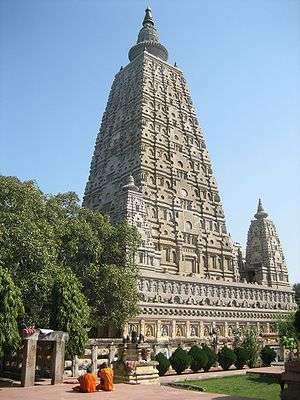 Bodhgaya is about 12 km from Gaya City. The NH83 Highway connects Gaya and Bodh Gaya. The State Tourism Department provides travel facility from Patna to Bodh Gaya. Train and bus service for Gaya are available from Kolkata, which is an overnight journey. Thai temple at Bodh Gaya. Bhutanese temple at Bodh Gaya. Vietnam Temple in Bodh Gaya. ^ "Hindoo Temple at Gyah, Bahar". Wesleyan Juvenile Offering. IV: Vignette. January 1847. Retrieved 17 November 2015. ↑ "पत्रांक-213 : राजगीर क्षेत्रीय आयोजना क्षेत्र एवं बोधगया आयोजना क्षेत्र के सीमांकन एवं घोषणा" (PDF). Urban Development Housing Dept., Government of Bihar, Patna. 15 April 2015. Retrieved 18 June 2015. ↑ Gopal, Madan (1990). K.S. Gautam, ed. India through the ages. 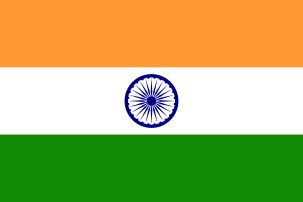 Publication Division, Ministry of Information and Broadcasting, Government of India. p. 176. ↑ "Decisions adopted by the 26th Session of the World Heritage Committee" (PDF). World Heritage Committee. p. 62. Retrieved 2006-07-10. 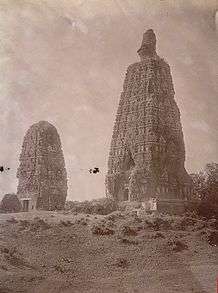 ↑ "Bodh Gaya | Dambadiva Buddha Vandana Buddhist Pilgrims". Buddhapilgrims.wordpress.com. Retrieved 2014-06-02. ↑ "Buddha Purnima - Festival of Buddhist". Shaadi.com. Retrieved 2014-06-02. 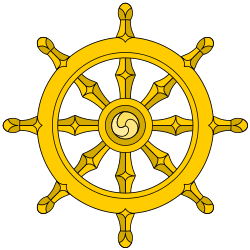 ↑ "The True Lord Buddha: His enlightment i.e. attainment of supreme wisdom, in 588 BC". Thetruelordbuddha.blogspot.com. Retrieved 2014-06-02. ↑ Barua, Sukomal (2012). "Buddha Purnima". In Islam, Sirajul; Jamal, Ahmed A. Banglapedia: National Encyclopedia of Bangladesh (Second ed.). Asiatic Society of Bangladesh. ↑ "Spectrum | Sundayobserver.lk - Sri Lanka". Sundayobserver.lk. 2012-04-22. Retrieved 2014-06-02. ↑ "A History of Bodh Gaya by Venerable S. Dhammika". Buddhanet.net. Retrieved 2014-06-02. ↑ "Information Dossier for nomination of Mahabodhi Temple Complex, Bodhgaya as a World Heritage Site". Government of India. p. 4. Archived from the original (PDF) on 10 February 2009. Retrieved 2006-07-10. ↑ "Buddha statue". Umdiewelt.de. 2008-05-16. Retrieved 2014-06-02. ↑ "Serial Blasts rock Mahabodhi temple in Bodha gaya: terror attack, Center says". The Times of India. 7 July 2013. Retrieved 7 July 2013. ↑ "Nine blasts in Bodh Gaya, 2 injured". The Hindu. 7 July 2013. Retrieved 7 July 2013. ↑ "BSTDC halts AC Bus Services to Bodhgaya devoid of Passengers". Retrieved 31 August 2013. ↑ "Bihar launches Tourist Caravan Service called Wonder on Wheel". The Biharprabha News.